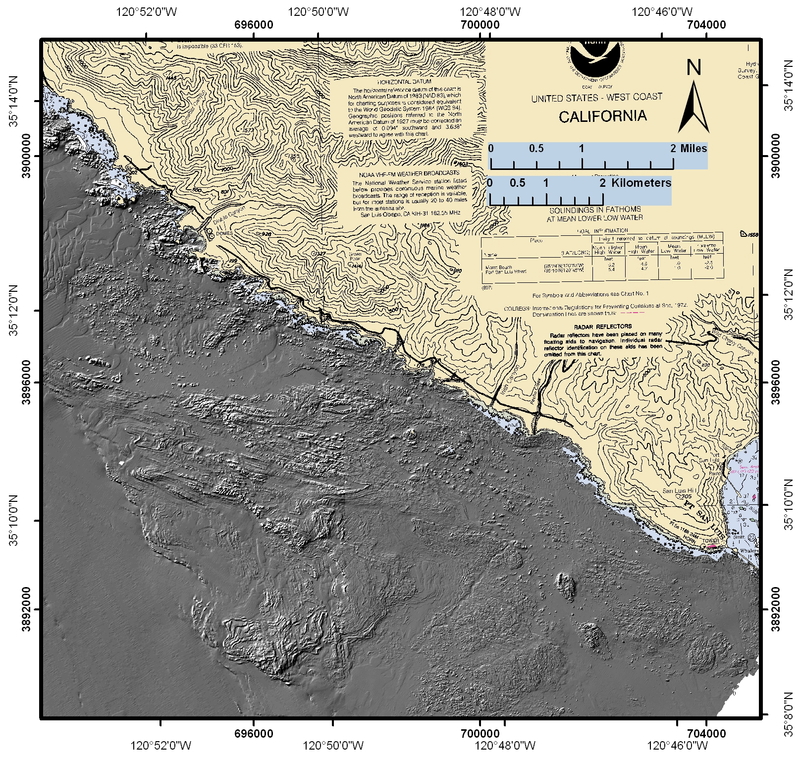 Area 6 includes the shore line of the Pecho Coast, located between Point San Luis and the Morro Bay Sandspit, the Morro Bay Sandspit to the north flank of Morro Rock, and the nearshore waters out to the 200 meter bathymetry line. The Pecho Coast marine environment consists of a 13 mile stretch of intertidal rocky reef beginning at Hazard Canyon in the north to Point San Luis. The shoreline is characterized by sheer, wave-eroded cliffs, jutting headlands, and massive offshore submerged and exposed rocks. Above shoreline the narrow coastal bench is flanked by hills. The tidal zone is generally narrow and may terminate abruptly where protection from wave shock is minimal and deposition is reduced or absent. These topographical features form a highly irregular coastline. The coast provides many different exposed and protected habitats which extend or control the abundance and composition of marine plants and animals. Long sandy stretches of coastline are found north and south of the reef. The reef supports important communities of vertebrates and invertebrates each integrally dependent upon each other and upon dense stands of canopy formed of kelp and lower growing algae. Damage to or extermination of reef fauna would result in a extremely slow recovery due to the reef’s isolation from other rocky coastal habitats and the nonmigratory behavior of indigenous species. This stretch of coast receives two extremes of human impact. One is the estimate of over half a million visitors per year to Montana De Oro State Park. Camping, fishing, walking, tidal collecting, surfing and seasonal whale migration-watching are the primary visitor activities. Because of the beauty of the area, a scenic trail from Point San Luis to Montano De Oro has been given the highest priority in a new county scenic trails program. The marine habitat and ecosystem in the locale is significant enough to have two state protected areas: the Point Buchon SMCA and the Point Buchon SMR. South of the park, controlled industrial activity and ranching are the only human activities. The Diablo Canyon Nuclear Power Plant has created, by its demand for security, an absence of active human presence along the coast within the plant’s sphere of influence. 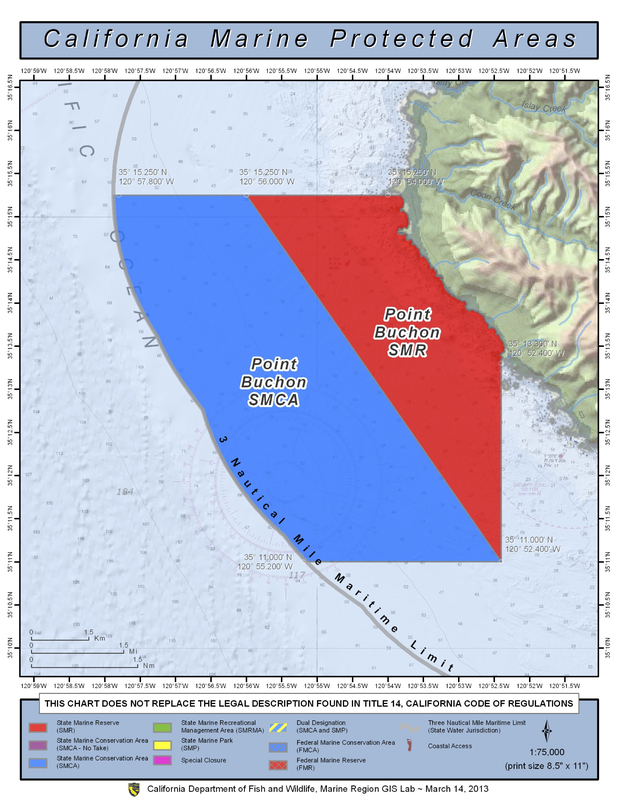 As a result, the Pecho Coast now contains California’s only mainland haulout area for the southern sea otter (1990), and a mainland haulout area for elephant seals (1990). Because of the combination of rocky intertidal zone, a seasonal upwelling off Point Buchon, large offshore rocks, kelp beds, climatic and oceanographic province transition zone, and lack of direct human interference, the area between Point Buchon and Point San Luis remains a lush floral and faunal habitat. The area supports a significant and growing population of breeding female sea otters, a large breeding population of sea lions which haul out at Lion Rock, a population of elephant seals which haul out on the mainland, a community of harbor seals, and a large number of seabird species populations. During their migrations, gray whales stack at Point Buchon waiting for a navigator whale to cross open bays on either side. Waters within the area are considered pristine not only due to the abundance of life as indicators, but because of the presence of Allopora Coral, an hydrocoral. This hydrocoral, a tree-like form usually found in waters 50 meters deep, has been discovered near Lion Rock in waters only 15 meters in depth. Studies at Diablo Canyon have provided a basis for revolutionary understanding of the age of the Chumash culture. A site here was the first which identified 9,500 years of continuous occupation by the Chumash along the California coastline. The information, for the most part, was based on artifacts dug up and removed from the Chumash Village burial grounds. Several other Chumash sites remain undated. There are indications of a longer occupation by the Chumash: 1) 9,500 years ago this was not a coastal village but one a few miles east of the coast, and 2) at the bottom layer of the site obsidian from Glass Mountain, Mammoth, on the eastern side of the sierra was found. Thus, trade relationships, which in themselves develop overtime, existed 9,500 years ago over vast distances of several hundred miles. Diablo Cove has been one of the primary focal points for intertidal research in the proposed sanctuary area. Financed by PG&E, numerous investigations have resulted in descriptions of an abundance of flora and fauna. Among a host of important finds, research shows the area to be an important nursery for both rocky reef and deep water fish. The research supports conclusions that the San Luis Obispo County coastline supports one of the richest intertidal rocky reef fisheries in the world. This research, however, neglected to make public the extensive damage the once through cooling system of the Diablo Canyon Nuclear Power Plant has done to marine life. Offshore seismic studies have also been extensive, resulting in detailed studies of fault zones. Ocean faulting creates habitat for sea life. But, acoustic seismic testing has caused considerable damage to marine life and must not be permitted in the proposed sanctuary area. Morro Bay is a young geologic feature, less than 15,000 years of age. Rising seas at the end of the last glacier period eroded coastal sands, developing a barrier beach in front of an eastward migrating beach system. The barrier beach, known as the Morro Bay sandspit, extends along the western edge of the estuary. Dunes migrate along the spit, which is about 4 miles long and a quarter mile wide. The spit connects to the mainland at the south end; having no roads or offroad vehicle trails allows a high value animal and plant habitat. Morro Rock is an ancient volcanic plug which stands at the harbor entrance. It is the most prominent rock feature along the coast of California. A rookery and roost for a number of birds species including the peregrine falcon, Morro Rock has been designated as the Morro Rock Ecological Reserve with an estimated one million visits per year. Morro Rock is one of a chain of plugs; most are onshore, but the westernmost volcano is submerged 59 fathoms below the ocean’s surface 7-1/2 miles due west of Morro Bay. The Chumash attach spiritual value to the volcanoes, with Morro Rock being a pivotal feature in their world-view. The Spanish referred to the plug as the Gibraltar of the Pacific. The entire sandspit-estuary complex at the center of the broader Estero Bay extends on the south from Hazard Canyon, north of Point Buchon, to Cayucos Creek on the north. Estero Bay is a closed littoral cell, from which beach sand apparently does not escape. Large areas of older sand dunes cover much of the shoreline in the southern parts of Morro Bay. Morro Bay is the only major California estuary south of San Francisco not significantly altered by human activities. As wetlands continue to disappear, Morro Bay’s international significance continues to grow. Morro Bay supports many birds protected by international treaty and provides a secure harbor for offshore marine fisheries. The Morro Bay estuary is now protected as part of the National Estuary program, the Morro Bay National Estuary. Located within the climatic and oceanographic transition zone province, the bay’s unique environment provides habitat for a rich mixture of northern and southern species at the ends of their respective ranges. These and other significant characteristics have brought about the designation of this area as the Morro Bay National Estuary. Morro Bay contains the only eel grass bed between Monterey Bay and Seal Beach. This bed acts as a vital nursery for fish and invertebrates. Seventy fish species are listed as occurring in Morro Bay. Thirty fish species are economically important, while most of the rest are ecologically important foraging species. Besides hosting a commercial fishing fleet, Morro Bay is a site of commercial sea farming. Oysters and mussels are cultured and harvested. 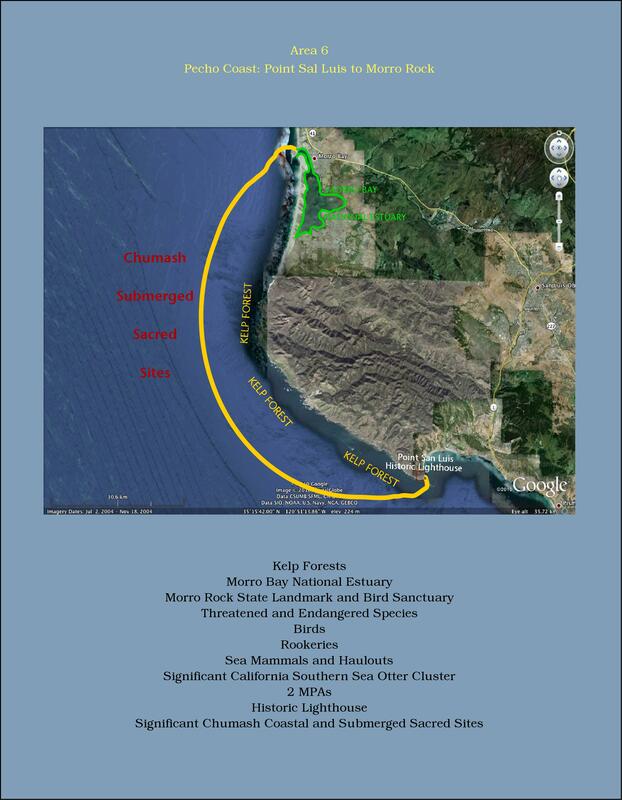 Along the southern end on the ocean side of the sandspit a pismo clam reserve has been created. With over one million visitors a year, tourism dominates the local economy, employing almost 40 per cent of those working in the City of Morro Bay. Morro Bay State Park Campground recorded over 1 million visitor days for fiscal year 89-90. Associated with the park is the Morro Bay Natural History Museum which recorded almost 80,000 visitors for f.y. 89-90. Recently, over 60 new Chumash archaeological sites were recorded in the area of Los Osos. Where the mouth of a creek once entered Morro Bay, an old Chumash village stood. The village’s age is unknown; it was destroyed to make way for an industrial use. Hundreds of Chumash sites ring Morro Bay. A large number of state and federally listed species reside in or depend on the Bay. Some of these species are the brown pelican, the peregrine falcon, the sea otter, the kangaroo rat, and the golden eagle. More History to come: from the historic San Luis Lighthouse, San Luis Harbor, to the Moro Bay harbor.